The page for Miller’s Ale House menu prices. 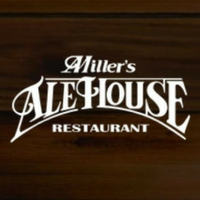 Miller’s Ale House Restaurant is an American casual dining restaurant and bar serving comfort foods such as juicy burgers, top-grade steaks, original pasta dishes, signature sandwiches, hearty salads and their famous chicken Zingers®. Besides the fixed menu options, Miller’s Ale House also serves daily specials for food and drinks. No shortage of drink options including 75 beers on tap, signature cocktails, and specialty drinks. All locations are open for lunch, dinner and late night. For sports fans looking for a place to watch live sporting events, Miller’s Ale House is the spot. Miller’s Ale House offers the ultimate sports viewing atmosphere with surround HD TVs. Get the gang together and head over to Miller’s before the game starts! Below is the latest Miller’s Ale House menu with prices. Last minute gift giving just got easier. No need to figure out if it will fit. Just head over to the Miller’s Ale House website to place an order. Gift cards come in several denominations and are delivered via postal service. What could be better than a night out at your local Miller’s Ale House? How about bringing the great tasting food home! Whether planning a social gathering at home or corporate event at the office, Miller’s Ale House party platters are a fantastic option. Guests choose their favorites dishes from the special menu. Platters feed a pre-determined amount of guests. Be sure to order enough and let the compliments begin. For guests with gluten sensitivity, Miller’s Ale House offers special gluten-free options. For those guests following a vegetarian lifestyle diet, Miller’s Ale House offers a selection of menu items that will be acceptable. Both menus can be found on the official Miller’s Ale House website or guests can ask their server. Hurry up and join! A free flatbread dish awaits you just for signing up. What other perks can guests expect from joining the Raving Fans email club? Regular emails about menu updates, special meal offers, and exclusive invites to local events. And the best part…free gift on your birthday! Miller’s Ale House believes in supporting the local communities in which they operate. Team members are encouraged to make a positive impact on the local community. Miller’s Ale House locations provide support through local school fundraisers, Toys for Tots drives, and other important causes. Guests are encouraged to contact their local Miller’s Ale House location for more details. Miller’s Ale House is in expansion mode and on the look-out for exceptional candidates. Candidates seeking to work in an environment that promotes honesty and challenges you, then Miller’s Ale House is the place to be. Check out the Career page on the official Miller’s Ale House website to learn about their core values and browse the list of careers currently available. The first Miller’s Ale House was opened in Jupiter, Florida in 1988 by Jack & Claire Miller. Growing popularity for the concept has led to steady growth resulting in 72 total locations in over 10 states. The restaurant chain is headquartered in Jupiter, Florida. Expansion plans continue as the chain looks to continue growing. Be sure to find a location near you. Miller’s Ale House loves social media. Be sure to follow and connect with them through various social media platforms. To learn more about Miller’s Ale House Restaurant, visit their official website.